You’ve just booked your next amazing adventure, and now you’re looking for the best travel money belt to help keep your valuables safe. 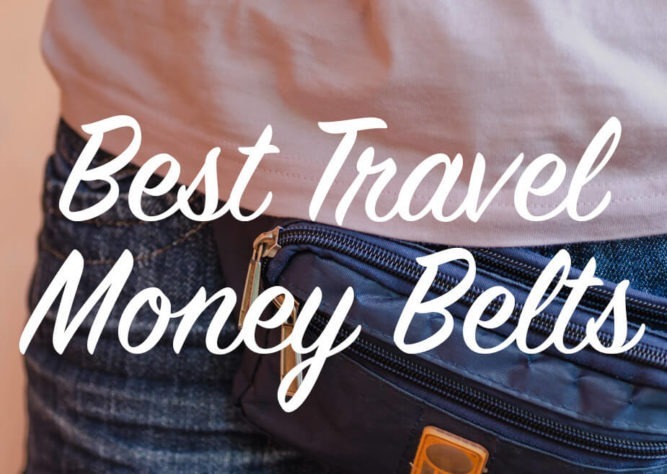 It’s a sad but true fact that travellers are often targeted for their money and whilst there is no foolproof way to be 100% safe, the best way to travel with money is by using the best money belt to conceal your valuables. Unfortunately, many travelers don’t give any thought to the best way to carry money while travelling until it’s stolen, which of course by then it’s too late. Having your wallet or passport stolen on your trip can be a real downer, not to mention inconvenient and expensive. I’ve never had that happen – knock on wood.. In these money belt reviews, I will take you through a few of the things you should consider to ensure you purchase the best travel pouch for you. I will then take a closer look at the different types of money belts for sale including options for the best waterproof money belt for travel, the best RFID blocking money belt, the best money belt for Europe, the best money belt for men and the best money belt for women. 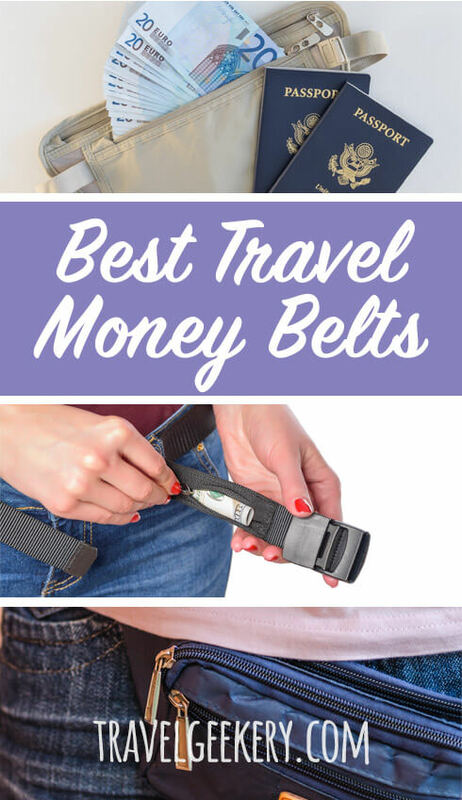 Hopefully after reading this guide on the best rated money belts for travel, you’ll know exactly the right type for you. Check out all my reviews here. What is a Money Belt and how should you use one? What to Consider when Purchasing the Best Travel Waist Pack? 1. What Activities will you be doing? 2. How long will you wear it for? 3. What items do you want to carry in it? What is a money belt? A money belt is quite simply a pouch big enough to carry your valuables, which is connected to a belt so you can wear it around your waist. It is often called a money fanny pack, a travel security pouch, a travel waist wallet and a range of other similar terms. 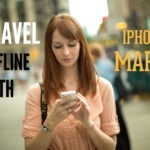 If you are looking at ways of how to hide cash while traveling, a travel belt is a great option. You can use a smaller, slim line hidden money belt under clothes, or a larger travel belt pouch on the outside of your clothes, although this is a less secure way to carry money while traveling. 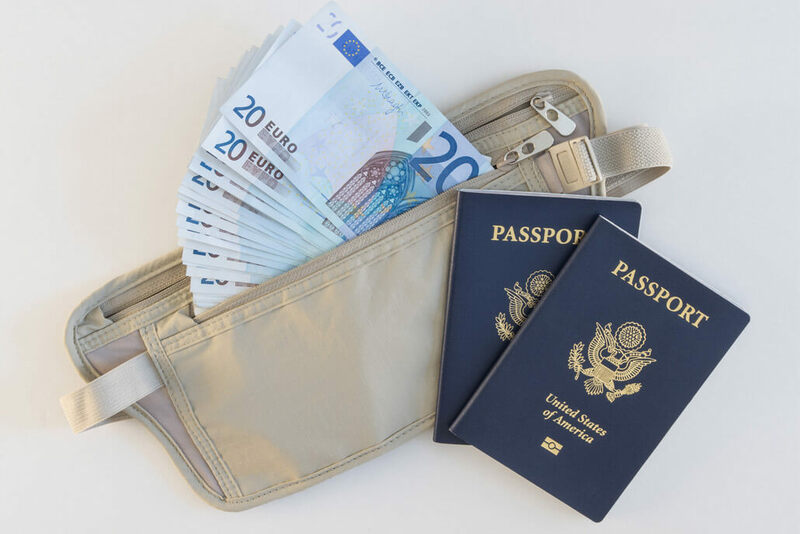 Some of the top rated money belts are large enough to carry your cash, passport, cards and other documents out of sight, making it not only the best way to carry cash while traveling but also a great way to carry your passport while traveling. You even get a small money belt which is simply for carrying cash. Some money belts are actual belts with tiny pockets for money. Many people don’t recommend a waist money belt as you have to pull your money belt out from under your clothes for every transaction. I don’t necessarily recommend this is how you should use your money belt. My recommendation is that you use your hidden travel pouch to store excess cash, passport and cards that you won’t need regularly and still have a cross over bag to carry a day’s worth of cash. The idea is to keep your travel waist pouch completely out of the public view. So if you do need to top up on some cash, go somewhere private to access the cash from your travel pouch under clothes. 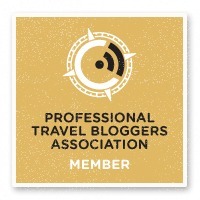 Don’t want to read my entire best travel waist pack reviews? Or just want to know my recommendation for the best travel money pouch? My choice for the best belt bag for travel is the Peak Gear money belt. I just love this belt because it’s a great size, perfect for all your valuables whilst travelling. It has built in RFID so will protect your electronic information as well as being lightweight and a slim design so perfect for wearing concealed under your clothes. Consider what it is you will be doing whilst you are wearing your travel waist bag. 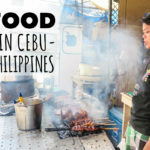 Will you be wandering around cities well known for pickpockets and so you want the best hidden travel wallet belt you can comfortably wear under your clothes? Or is it more for convenience and you are happy to wear it on the outside of your clothing? Some money belts are designed for running, whilst others are designed to be waterproof or water resistant, which is perfect if you will be wearing it somewhere it is likely to rain or have it around the pool where it may get wet. Will you be wearing the belt wallet pouch for long day trips? If this is the case, you will want a good quality one that won’t irritate and itch your skin. Comfort will also be super important for long wear. I’d also recommend looking for one that is made from fabric that’ll wick any moisture away. For the most comfortable money belt, consider how much it weighs. The best money belt for international travel is one that is lightweight as you will become frustrated and annoyed with a heavy belt strapped to your waist at all times. What do you plan on carrying in your money belt? Do you want something large enough to carry your passport, money, cards, keys, phone and other documents? 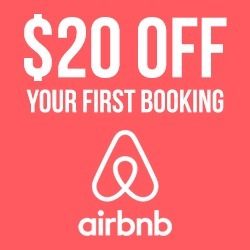 Or will something small just for some excess cash do the trick? The more you want to carry the bigger and less concealable the pack will be. If you do want to carry multiple items in your money belt you may like to consider one with multiple pockets, so you can easily organise your items. In this day and age, it’s not someone just stealing your money you need to be concerned about, but also someone stealing your electronic information. If this is of concern to you consider getting one of the best RFID money belt options. RFID is the same technology that is found in your passport, key cards, driver’s license, smartphones etc. which allows you to swipe or tap to pay for items or to be identified. RFID makes life easier for us, however it also provides an opportunity for thieves to use a RFID reader to electronically steal our information without us even knowing. A RFID belt has built in technology that blocks the ability for an RFID reader to access your personal information. If you’re looking for places to hide money when travelling, then consider my favourite hidden money pouch for 2019, the Peak Gear Money Belt. The Peak Gear under clothes money pouch is a fantastic quality, money and passport belt with 2 separate compartments to organise your valuables, easily being able to store multiple passports, credit cards and money. It is a RFID travel pouch with built in RFID to protect your personal information from electronic theft and Peak Gear are so confident in their product that they will reimburse you up to $250 for any items that are stolen from your belt! it includes premium YKK zippers and the dual side-release buckle ensuring the belt does not accidentally come undone. This money belt also comes in three different sizes to ensure the perfect fit. If you are after the best travel waist pouch, you will not be disappointed in the Peak Gear money belt. If you’re after the best money belt for European travel, you will need one with stacks of room like this Zero Grid Money Belt. You can fit so much in this money belt, there is even room for your phone making it the best travel security belt for those with heaps of valuables to store. There are 2 separate zippered compartments which you will easily fit in your cash (even different currencies! ), passport, boarding passes, credit cards, smart phone, as well as inner pockets and a carabiner clip to secure your keys. This really is the ultimate passport and money holder. With so much room, this wallet is ideal for long term travel and in fact would make the best travel wallet for backpacking as well as European travel given you can easily carry all your valuables in the one place. This is the perfect anti-theft belt and a great choice for the best security travel money belt. The Venture 4th Security Money Belt is another great choice for those travellers looking for an anti theft money belt. This travel waist belt will protect your personal information from electronic theft and hacker scams by using the inbuilt RFID blocking technology. As well as keeping your information safe, I love the various compartments this money belt has to keep your valuables organised. There are 2 large zippered pockets as well as a mesh separator which is perfect for separating different currencies. You can easily carry your cash, credit cards, travel documents, passport, keys, smart phone and more in this money belt. This is a slimline lightweight undercover money belt constructed from waterproof 210D ripstop nylon and double stitched reinforced seams to prevent rips and tears. 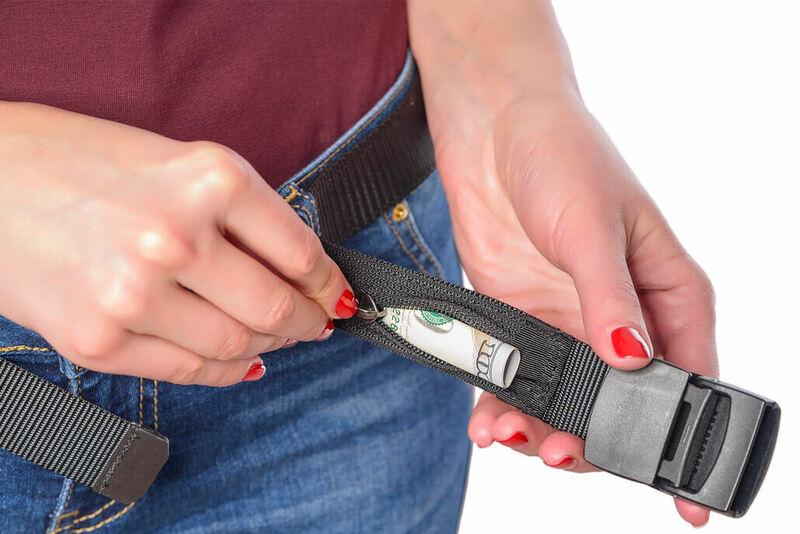 Other great features of this concealed money belt include the adjustable elastic straps for waists up to 56 inch and it’s made from soft and breathable fabric keeping you dry and comfortable during your travels. The Venture 4th money belt is the perfect choice for those after the best hidden money belt, it is the best way to hide money while travelling as well as carrying credit cards, passports and other information you want to keep safe. I love the Pacsafe Coversafe S25 Bra Money Pouch, it’s got to be the best travel money belt for women. It’s perfect for storing away excess cash and credit cards. This is a small secret pouch for travel made from lingerie fabric, so it is nice and soft against your skin and machine washable. There are similar undergarment travel pouch options on the market, but what makes this the best hidden money pouch is the adjustable elastic strap so you can adjust it depending on the bra you are wearing for a snug fit. You could even wear it on your swimsuit and being fully adjustable you can choose to wear it in the centre of your bra or under your armpit. For extra security you can even tuck it into your bra cup. Unfortunately, this bra money holder is not big enough to carry a passport, so if you are after the best travel pouch for passport, consider one of the bigger travel money belts in this post. The best waist wallet can come in all kinds of shapes and sizes, including everyday conventional belts, like this leather money belt from LeatherBoss. This best leather money belt is perfect if you are looking for a mens money belt, it is 1.25 inches wide and comes with a hidden interior zipper. This men’s belt with hidden zipper offers the ultimate protection from theft whilst only carrying a small amount of money. This men’s money belt comes in multiple sizes depending on waist measurements. The Boxiki money belt is the perfect choice if you’re after the best small travel wallet, it is a great flat money belt perfect for storing your valuables whilst you travel. There are 2 separate zippered compartments, which will easily fit in your cash, passport, boarding passes, credit cards, smart phone, as well as a hidden inner pocket. This best travel belt wallet has built in RFID blocking theft protection designed to protect your electronic information. Made from high quality durable 210 D heavy duty rip stop nylon, this RFID travel money belt won’t be easily damaged. The fabric is soft, water resistant and lightweight with a mesh breathable back; it also includes an adjustable waistband for the perfect fit. This is a great slimline hidden money belt for travel perfect for the traveler who wants to wear it comfortably concealed under their clothes. The Alpha Keeper Money Belt for travel is yet another great option for travellers looking for the safest way to carry money abroad. Made with 3 layers of 100% RFID blocking material and high quality water resistant 210D rip stop nylon this is a high performing money belt. As a bonus with this hidden fanny pack you will also receive 7 individual RFID blocking sleeves to use in other luggage. This money belt bag has two zippered compartments and is large enough to carry cash, passport, phone, keys, cards and other travel documents. Available in two different sizes and seven vibrant colors, this money and passport belt also features high quality YKK zippers, an adjustable elastic strap and is lightweight. This slimline designed passport money holder is perfect for travelers looking for the best way to carry cash while traveling. If you’re after a hidden waist wallet perfect for storing everything you could possibly need for a day of sightseeing, then you will love the Pacasso money belt. Large enough to carry your smart phone, passport, keys, cash, cards and a range of other travel documents with built in RFID protection, this a great waist money bag. There is even an earphone hole so you can listen to your favourite music whilst waiting at the airport or on a long bus trip. This under clothes fanny pack is ultralight and breathable. Made from high quality 100% durable waterproof nylon you won’t need to be concerned if you get caught in a downpour whilst sightseeing. The back has a mesh panel to keep your skin cool during the day and an adjustable strap for the perfect fit. The Pacasso is your perfect mens travel belt or ladies money belt and ideal if you are wondering how to carry money when traveling. The Eagle Creek money belt is a small money belt just the right size for your passport, cards and cash. This is a versatile pouch that can be threaded on to a belt or simply tucked in your pants pocket. This travel pouch for passport and money has one main compartment with two inner mesh pockets so you can keep your passport in one and your cash in the other. Made from water resistant, durable and lightweight nylon ripstop material you will have peace of mind knowing that this pouch is designed to last. The Eagle Creek money pouch is perfect for travelers wanting the best money pouch which is compact and just big enough to store their valuables whilst travelling. The last money belt among these reviewed is the Mind and Body Experts Orion belt, the perfect travel belt for the active traveller who might also use the belt whilst running or hiking. This best waist bag for travel is lightweight and designed to stay in place and not bounce around as you move, so it’s perfect for hikers or runners. Made from water resistant fabric you won’t be concerned about your valuables if you get stuck in a downpour. This money belt contains three separate compartments with enough space for your keys, phone, money, passport, cards and other travel documents. It even has a strap where you can secure a small water bottle. With a stylish look, you will feel comfortable wearing this belt under or over your clothes. Ok, now you have 10 best travel money belts to choose from. I hope that’ll make your deciding easier! Whether you decide to go for the Peak Gear money belt or any other one, do let me know how it’s working out for you and your valuables. Thank you for the great tips! I always carry a money belt or a neck wallet under my shirt! Thank you Starla! It’s definitely a smart thing to do!